It was a yellow house on the corner of Hornby and Pacific that made Umberto Menghi a household name across Vancouver, but the chef’s cooking days started long before in the rolling hills of Tuscany, Italy. Umberto left his family home at the age of twelve to pursue his dreams of becoming a culinary chef and never looked back. Having worked around the world in hotels and restaurants alike, Umberto brings a wealth of knowledge and expertise to Canada’s culinary landscape. Alongside an exciting re-entry into the downtown core of Vancouver with Giardino, Umberto also has La Trattoria, a successful restaurant in the heart of the world renowned ski resort in Whistler, B.C. 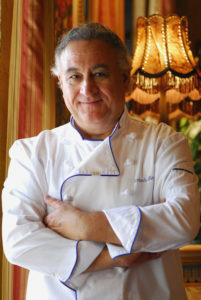 In addition to penning five best-selling cookbooks featuring authentic Tuscan recipes from his homeland, Umberto also hosted a popular cooking show, “The Elegant Appetite”, and opened a cooking school and luxury resort in Ripoli di Lari, Tuscany named Villa Delia, after his mother.